History: 50 year old man with cyanosis and chest pain. Pulmonary Arteriovenous Malformation: Axial CT scan of the chest in lung windows shows a tubular opacity in the right upper lobe (arrow). An additional tubular opacity is partially visualized posteriorly (not labeled). This is a case of pulmonary arteriovenous malformation, which is an abnormal communication between a pulmonary artery and pulmonary vein. Pulmonary arteriovenous malformations are typically round or oval shaped, and often a feeding artery and draining vein can be visualized. 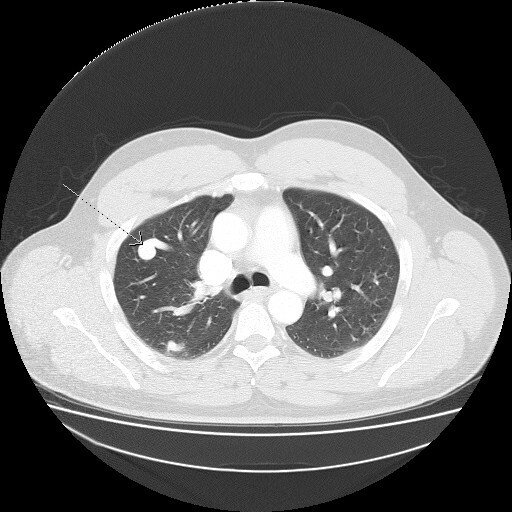 The differential diagnosis for this CT appearance includes pulmonary arteriovenous malformation carcinoid tumor, metastases, septic emboli, and solitary pulmonary nodule. When pulmonary arteriovenous malformations are congenital, they are usually associated with hereditary hemorrhagic telangiectasia, also known as Osler-Weber-Rendu syndrome.